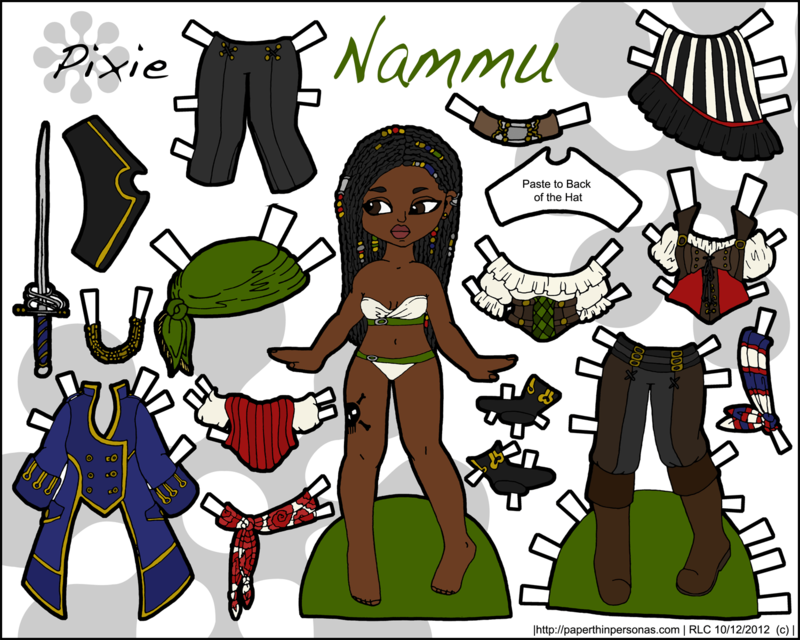 So, a version of this paper doll set got to become magnetic and is on it’s way to my grandmother, hopefully to get there before Valentine’s Day. Her set has a different doll with it, but I liked this doll a lot. The truth is that I have owed her a magnetic paper doll set for a while and I would be nervous about saying this online, but since she doesn’t seem to believe in the internet, I think I’m safe. I tend to be of the view that when you get to a certain age than you can decide not to use the internet if it suits you. I plan on becoming a grouchy old woman who may or may not chase children off my porch with a shotgun. Anyway, this is a busy week for me. There’s a birthday in my family and Valentines Day for which I really should draw a paper doll. I did one for the Chinese New Year after all. I’m also pleased to announce I now have a Showcase page inspired by Toria’s wonderful one. 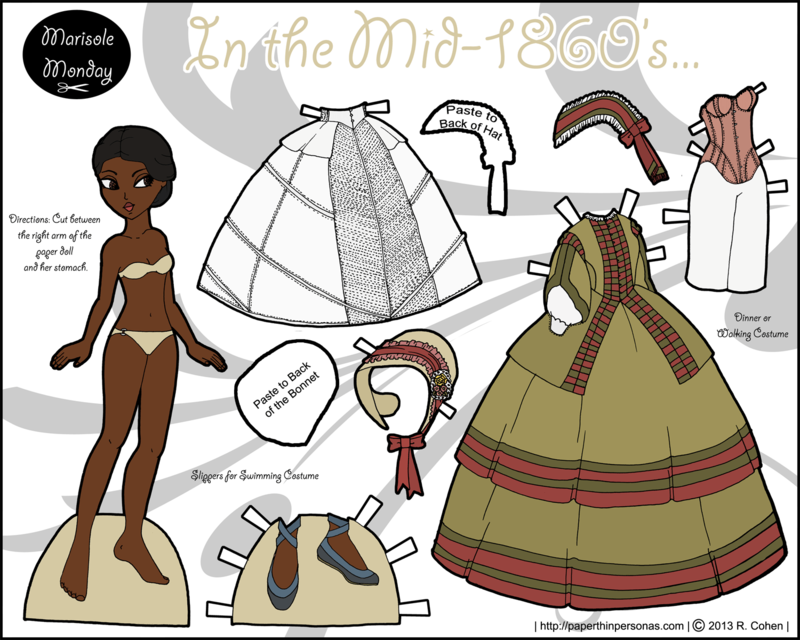 I am looking for more people’s colored versions of my black and white paper dolls or costumes you might have drawn for the paper dolls or anything else related to the paper dolls on this site that I might feature, so please email me“>email me if you have work that you would like included. Questions? Thoughts? Theories on the meaning of life? Feel free to comment. I do love comments. So, the black and white version of today’s paper dolls went up last week and I, being a space cadet, sorta forgot to post the color version, though I finished it on Sunday. 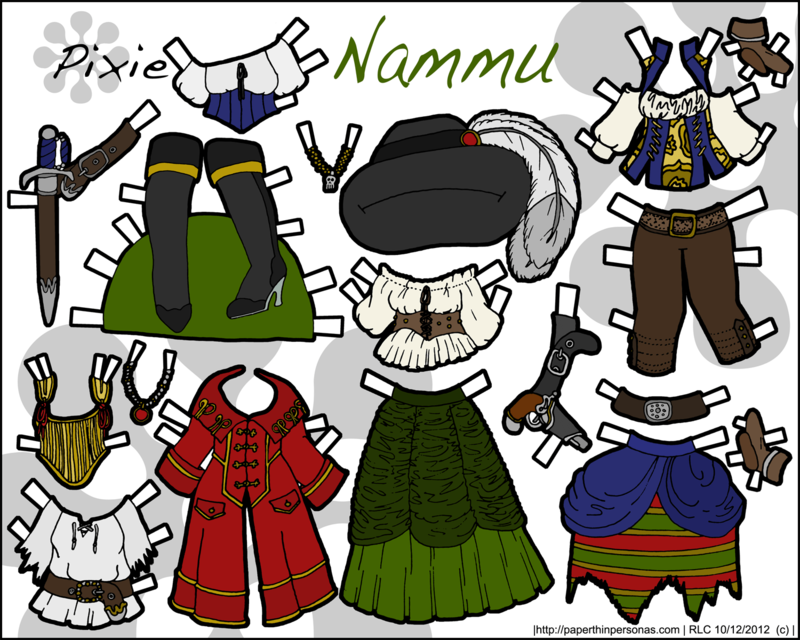 I hope a little belated paper doll posting will be forgiven. 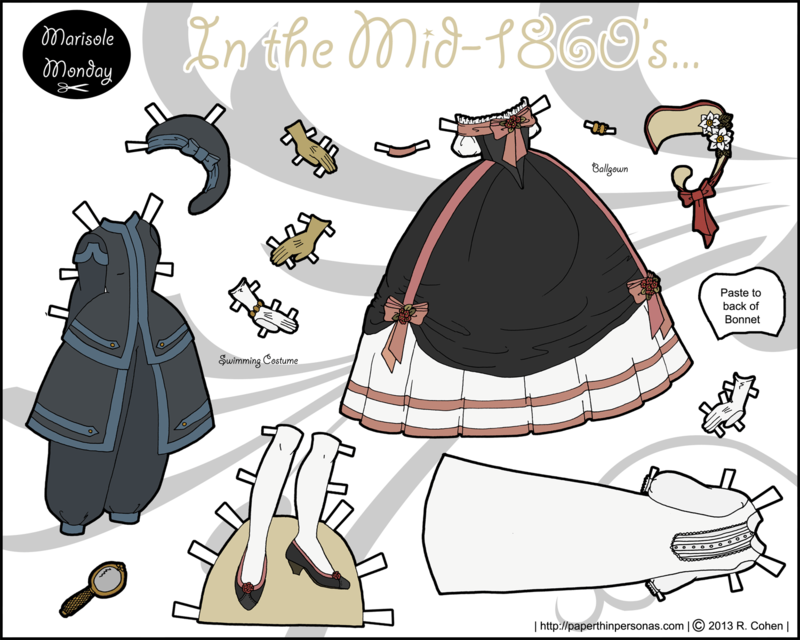 Our first page of this set is just the dolls and the second page is more clothing for them. I chose a soft blue, green color scheme with red accents. Of all the eras of men’s clothing, I confess a soft side for the 18th century. Have I mentioned this week has been INSANE? Because it has been, and classes get into full swing next week, so things are not looking to be much more peaceful. Despite that, I’m enjoying it. As I know I’ve said before, I would far rather be busy then bored. I also seem to have a lot of stuff inked, but I’m having trouble getting it onto the blog, so I am going to put some more effort into getting it scanned this weekend, so that it can go up. Here we are today with the colored version of last Monday’s post. Color for historical garments is complicated, because colors are very much a matter of taste and a matter of time. Just as the avocado and burnt orange polyester shirts of the 1970’s seem dated to us today, the colors of the past are rarely how we imagine them to be. I always picture the Victorians in tones of sepia, not because that was what they wore, but because I always see sepia photographs. I once had a professor point out that the way we picture the past has little to do with how the past actually was, but I enjoy my fantasies of the past as much as the next person. 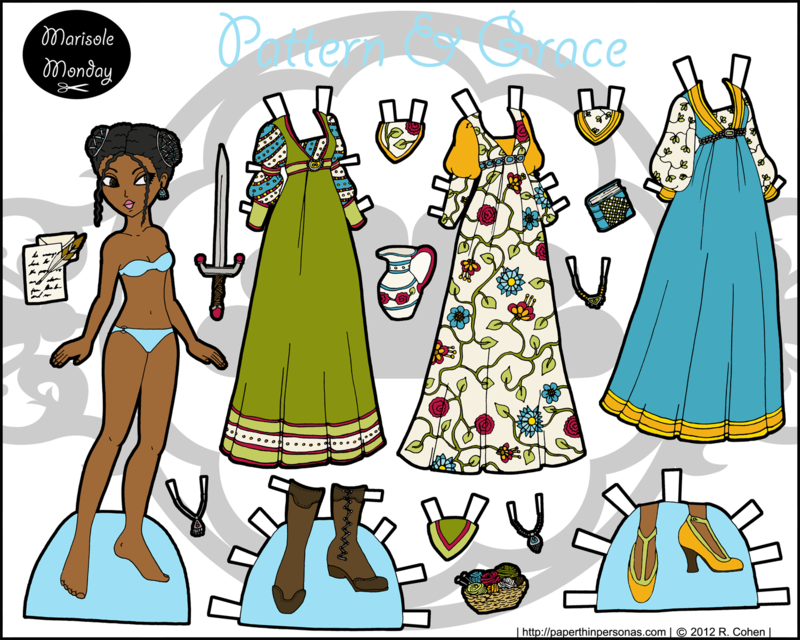 For this set of paper dolls, I chose to use colors from reproduction quilting cottons as a basis for the garment. They turned out to be a little muddier than perhaps I would have chosen on my own, but I wanted something different than the oranges, blue, pink, and green combination of colors I find myself most often drawn too. 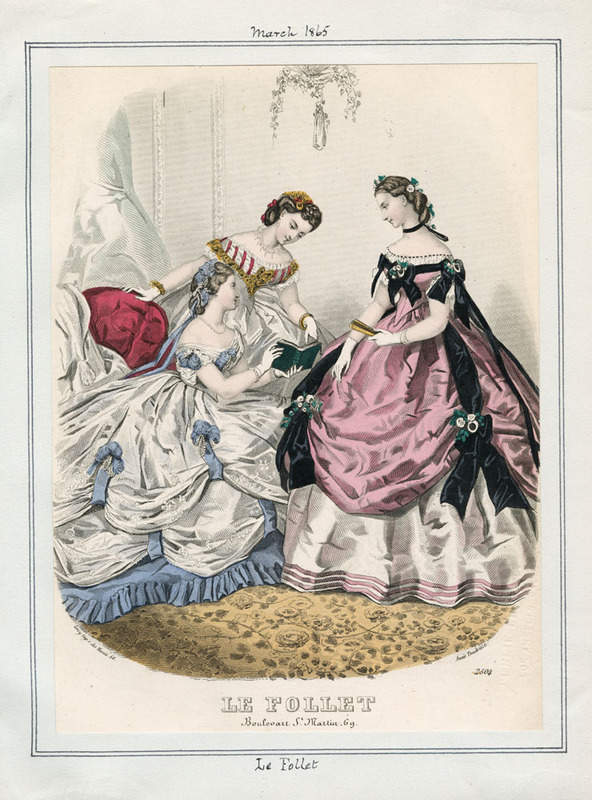 The ballgown in pink and black is based on the fashion plate which I drew it from, though I made a slightly darker version of the original. I’ll confess openly that I’m not entirely pleased with how some of these came out in color. I went muted and I think that was the right call, but I’m not sure that I didn’t lose some of the lusciousness and the vibrancy of the era. They also came out less romantic than I had hoped they would be. I do think Margot is awfully cute with her freckles and red hair (yes, I do have a weird thing for redheads). In truth, I am pleased with both the dolls. I think Marisole is a warm brown this time and I like how Margot came out. All in all, though I had some second thoughts about drawing a new face for Marisole, I am pleased with Margot and I think she’ll show up a bit more around the blog. On an unrelated note, child paper dolls have pulled into the lead in the polling… a fact which I am very much surprised by. I’ve mentioned before my “skintones make shoes a pain” thing, and so I wanted to give this Marisole a skintone that was shared by another doll so that she could share shoes. I chose Candy Coated Couture, but I don’t think the skintones are actually the same. In fact, a quick check with photoshop’s eyedrop tool tells me they aren’t. This has something to do, I think, with how Photoshop saves things for the web. I am going to try a few other methods and see if they help. It’s a strange problem indeed. Since it’s Christmas Eve, I wanted to wish a everyone a lovely Christmas. Be safe and be merry. I am back in Alaska with my family celebrating. I’m a little ashamed of how long it took me to get this paper doll up and I have absolutely no excuse since the paper doll was colored weeks ago, but with family visits and a nasty cold, it took longer than it should have to be done. If you’ve forgotten, the black and white version contained a rant about how complicated the floral pattern was. I’d like to say it was easier to color than it was to draw, but that would be a lie. Coloring that floral pattern was a pain in the neck. Still, I’m quite pleased with how it came in and, while I am in a bit of a cold medication induced haze, I think the whole paper doll is fairly charming. I sort of regret not making her blond so that her hair net things would be more obvious, but that’s my only complaint. By the way, lately Marisole’s face has been reminding me a little to much of an insect. If I redrew her head, would people be horridly upset? I’d make sure her clothing still fit. Let me know in comments. 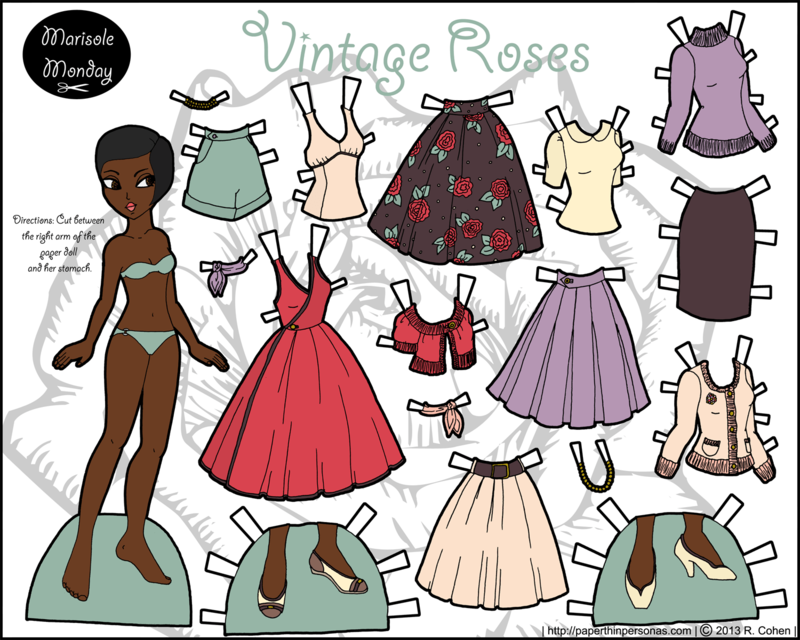 goldenSo, I did this paper doll set once before, well… not this set exactly, but a very similar paper doll set called Mint and Roses. Now the idea was to try a similar color scheme and see if I liked it better. I think I do. I traded the grey for a dark chocolate brown (which has a lot of blue undertones) and the green is less muddy. 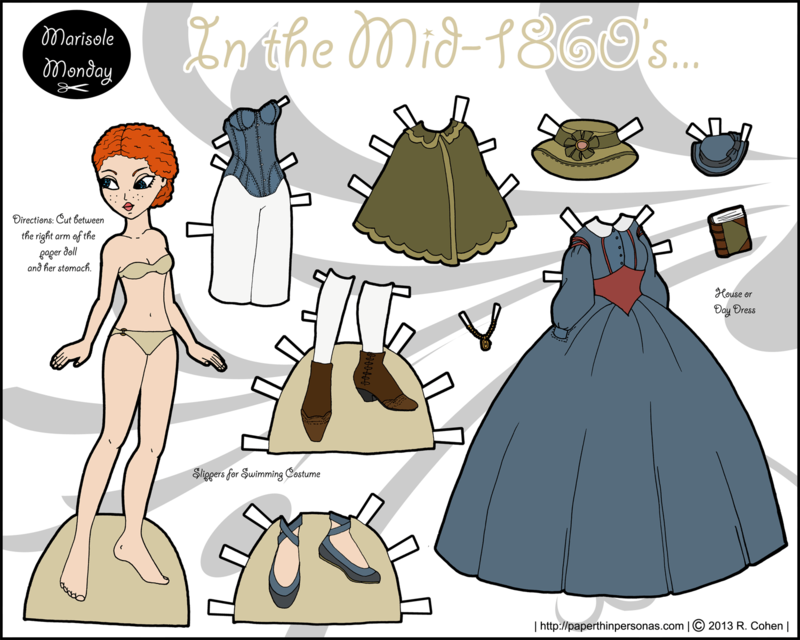 On the whole, I think this set works better, though I sort of miss the orange hair of the other paper doll. Things are up a little later tonight then I had planned. I have been fighting with the United States Postal Service lately about if I do or do not exist. They think I don’t exist. I swear I do exist. I’ve called them twice now and spoken to them in person once. I am getting ready to leave a nice little note in my mailbox for my carrier assuring him or her of my continued residency. I should add that I actually love the USPS. They do amazing things. They get mail across this country in a remarkably short period of time. They are amazing. 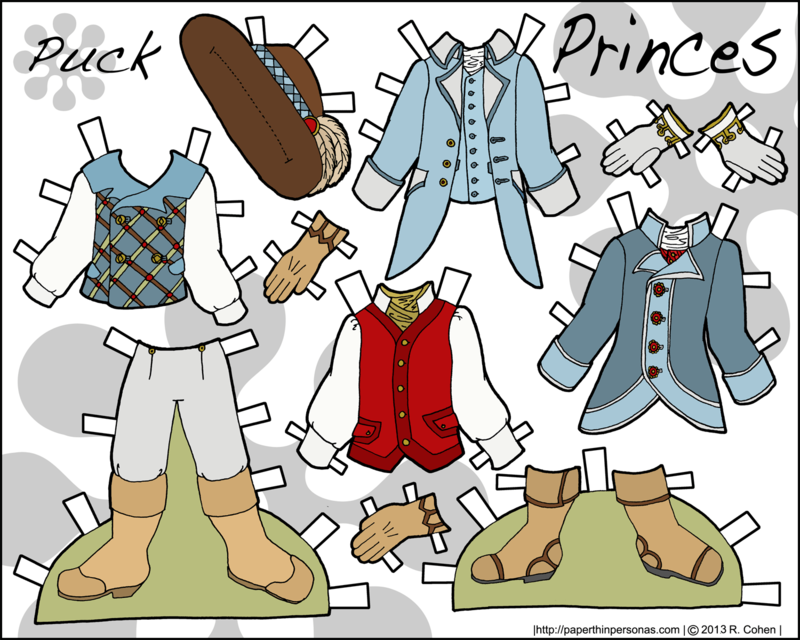 Anyway… on an unrelated, look its a paper doll. She’s cute. She has a really puffy skirt.